Home→Unique Claims to Fame→Cliff Dwellings Manitou Springs, Colo.
Cliff Dwellings Manitou Springs, Colo. The three-story pueblo building was used as a Native American home until 1984 and now houses the museum and gift shop. Dismantling an entire village piece by piece and relocating it more than 300 miles away is no easy task — especially by oxcart, railroad and horse and wagon. Yet Virginia McClurg, a local resident of the Manitou Springs, Colo., area, did just that. 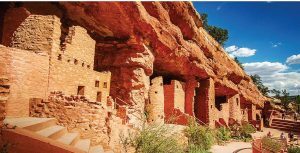 She was enamored of the historic millennia-old cliff dwellings of the Anasazi people, who inhabited the Southwest from 1200 B.C. to A.D. 1300. By 1904, the year McClurg launched her three-year labor of love, the brick structures, which stretched along the McElmo Canyon in the southwest corner of Colorado, had devolved into ruins and were regularly falling victim to vandals, looters and relic hunters. Congress had not yet passed the 1906 Antiquities Act and was uninvolved in protecting such historic sites. McClurg, determined to preserve the ruins, formed the Colorado Cliff Dwellers Association and hired William Crosby’s Manitou Cliff Dwellings Ruins Company to begin the relocation. The company spent several months mapping out and drafting blueprints of the various adobe and clay dwellings and acquired the rights to move them to a compatibly shaped cliff face in Phantom Canyon, renamed Cliff Canyon, in Manitou Springs. The dwellings were deconstructed brick by brick and each piece was labeled, numbered and carefully packaged for transport. The bricks were reassembled at the new location, with the crew replacing the mud and clay mortar with concrete mortar to ensure the structure’s stability. Well-known anthropologist Dr. Edgar Lee Hewett lent his expertise to the project. The 40-room cliff side village was opened in 1907 to members of the public, who were — and still are — encouraged to walk through the rooms and touch the structure, clay ovens, pottery, tools, weapons and other Anasazi artifacts preserved onsite, in accordance with the site’s “Please Touch” policy. 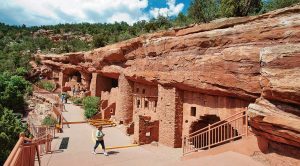 Visitors can explore the ruins during self-guided tours, learning about the Anasazi culture, religious worship, diet and recreational activities. The tourist complex includes a three-story pueblo building housing a museum and gift shop, a snack bar and picnic area and a scenic nature walk with labeled native flowers, herbs, trees and other vegetation. 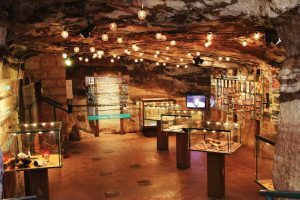 Among its exhibits, the Anasazi Museum displays dioramas of the tribe’s daily life; the gift shop features handcrafted Native American jewelry, art, pottery and crafts, as well as educational books and videos. The pueblo building reflects the architecture of the Taos Pueblo Indians of New Mexico, descendants of the Anasazi cliff dwellers. The building served as home to a Native American family of dancers until 1984. Visitors can also spend time with the sociable rescued and adopted timber wolves — including males Kiowa, Ghost and Spirit and female Apache — residing in the enclosed wolf area on the premises. The Manitou Cliff Dwellings are open year-round, weather permitting, seven days a week from March through November. The site is open 9 a.m. to 6 p.m. May through August; 9 a.m. to 5 p.m. March, April, September and October; and 9 a.m. to 4 p.m. during November. The complex operates winter hours from December through February, when it is open 10 a.m. to 4 p.m. Friday through Monday. Manitou Springs, population 5,322, is nestled near the base of Pikes Peak and is considered Colorado’s first resort destination. The surrounding springs emanate from an underground system of cavernous aquifers. The running water creates carbonic acid as it erodes the surrounding limestone, causing a carbonated percolation, which absorbs sodium bicarbonate and other healthful minerals before the water bubbles to the surface. Native Americans interpreted the water’s effervescence as the breath of the Great Spirit and revered the area as sacred ground. The soda water helped alleviate sour stomachs and dry skin, and Utes, Cheyenne, Arapahoe and other tribes peacefully shared in its benefits. Zebulon Pike overlooked the springs, but botanist Dr. Edwin James, the first American to conquer the peak, discovered them. Other explorers soon came to investigate the phenomenon. Among their number was Daniel Boone’s grandson and his two sons, John C. Fremont and a large number of tuberculosis sufferers seeking a cure. 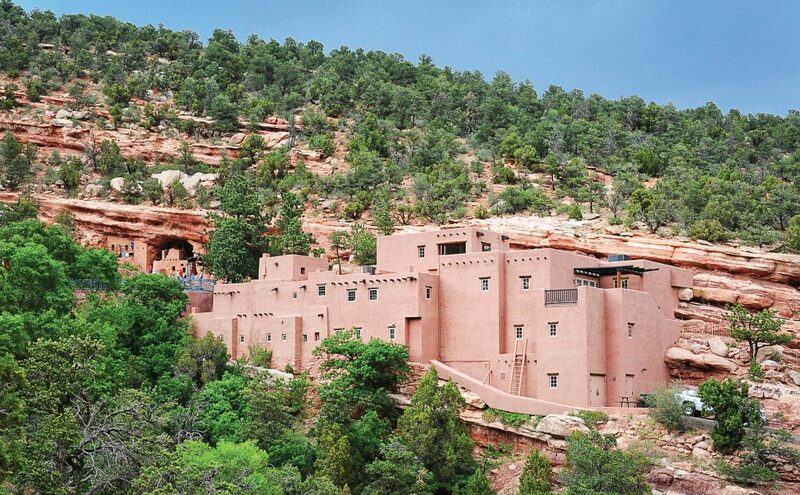 The modern entrance beckons 175,000 visitors a year to the millennia-old cliff dwellings. A walkway and handrailings were installed to provide safe exploration of the cliff dwellings. The rooms themselves are not wheelchair-accessible, but wheelchair-bound visitors are admitted free to the site. The 40-room Anasazi cliff dwellings were moved brick by brick more than 300 miles to Manitou Springs and opened to the public in 1907. The museum at the complex contains exhibits displaying the life of the Pueblo tribes in the area. English military officer George Frederick Ruxton wrote extensively about the springs’ benefits in his book, “Life in the Far West,” published in 1846. The book influenced entrepreneurs to build a railroad spur to the area and establish a European-style health resort to take advantage of the medicinal value of the springs. By the 1890s the resort town boasted seven grand hotels, several boarding houses and summer rental cottages to accommodate the thousands of yearly seasonal visitors, including such notables as P. T. Barnum, Thomas Edison and Jerome Wheeler, president of Macy’s Department Store. The advent of automobile travel prompted Manitou Springs to construct auto-court motels, automobile tours and other attractions such as dance pavilions and high-class restaurants. After a period of stagnation, the city reinvented itself, forming the Mineral Springs Foundation in 1987 and renewing interest in the springs as a tourist attraction. For more information, call (719) 685-5242 or (800) 354-9971 or visit www.cliffdwellingsmuseum.com or www.manitousprings.org.